Personally, I wouldn't book a cruise in October since it's right in the middle of hurricane season. It's out of Los Angeles, California. This parody would make Weird Al proud! That listing is for the Rock Legends cruise. Check the specific band names, and the 70K setlists will come up. If we do actually get another 9 (or 10) bands, I’ll be pleasantly surprised. Otherwise, I’ll just enjoy what we’ve got. It’s a pretty good lineup for me as-is. I'm hoping for Brothers of Metal next, but predicting Borknagar or Beast in Black. We don't have an industrial band yet, do we? I would love Eisbrecher or Turmion Katilot. If you want industrial, Ministry just finished touring...and they were fantastic! Brujeria would be perfect, since I'm gonna be wearing one of their shirts anyway! Same. A little surprised that they're a Cripper announcement. Tribulation or Turisas for "T" would make me extremely happy. Wasn't Uli supposed to be onbroad? Guess Leaves Eyes will be onbroad too. Will we finally get Amon Amarth? 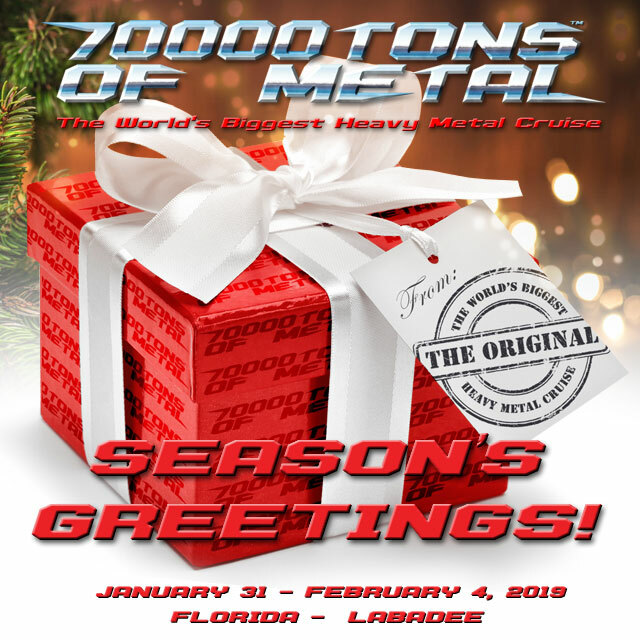 We wish all Sailors and Metalheads around the world Happy Holidays. What's in the box? Dare I think...might it be...an....ANNOUNCEMENT??????? Zero chance that Slayer would ever do the boat ,is 70k sells out without them ,why in the World would they spend the money to book them. For the same reason I think Andy started 70000 Tons. Because it was a dream, and he thinks it would be a great thing to do. Re: Welcome SUBWAY TO SALLY onbroad! There hasn't been an announcement for over a half hour. WTF? "We're almost there, sailors. Just 5 more days to the 5 Months announcement!"